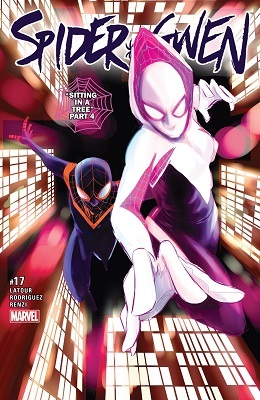 As much as I like Gwen's costume, the mask combined with that hood must be damming on her field of vision. Perhaps she has a see-through cloth idk. 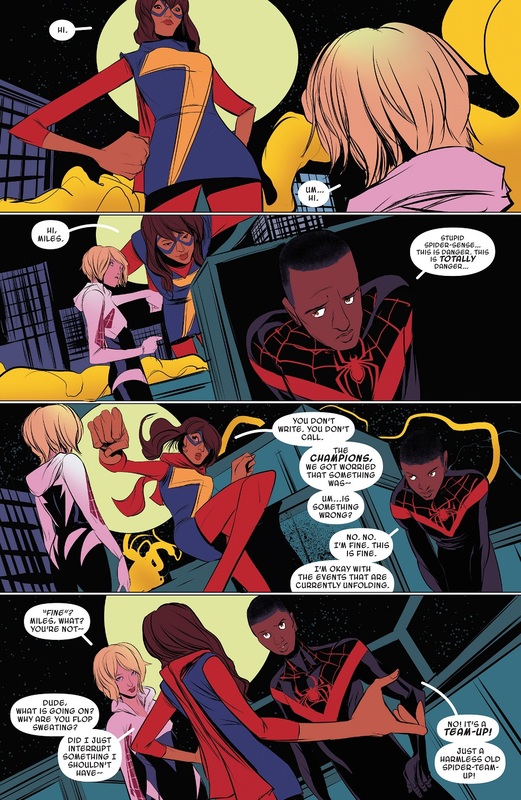 Also the only interesting part was Ms.Marvel who I wish they teased a relationship with Miles instead, but at least this was better than the boring Bendis issue last week. I like MCU Spidey's explanation. The full-face mask helps in preventing sensory overload in someone with heightened senses. 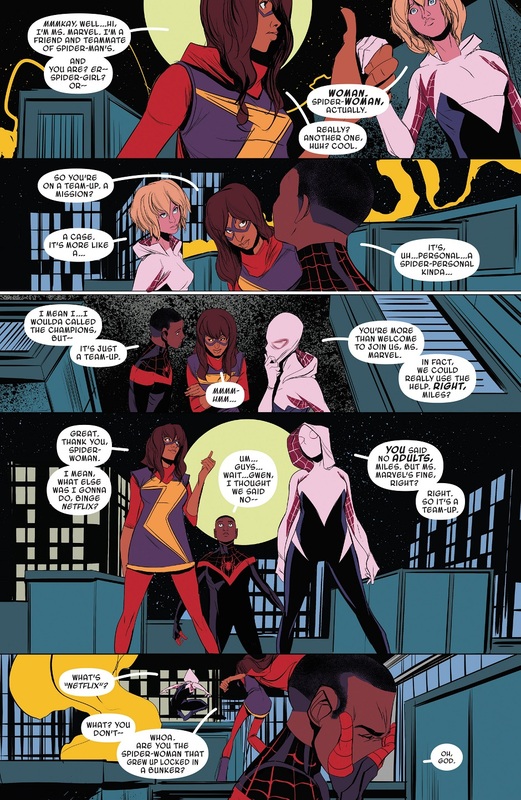 Hah, I kind of love how Kamala is totally in "not for me" mode, but whenever someone else is getting even a bit romantic she goes straight into matchmaker-mode. She's a shipper, that one. Hah, poor Miles. I'm assuming that his crush on her from the Avengers Annual is canon, so that had to be mortifying. It wasn't just the annual, i think it was mentioned in his book too. Miles has the worst luck. First Utimate Kate is Hydra. Then the train wreak that is Gwenpool. Now he's stuck in the friend zone with these two. 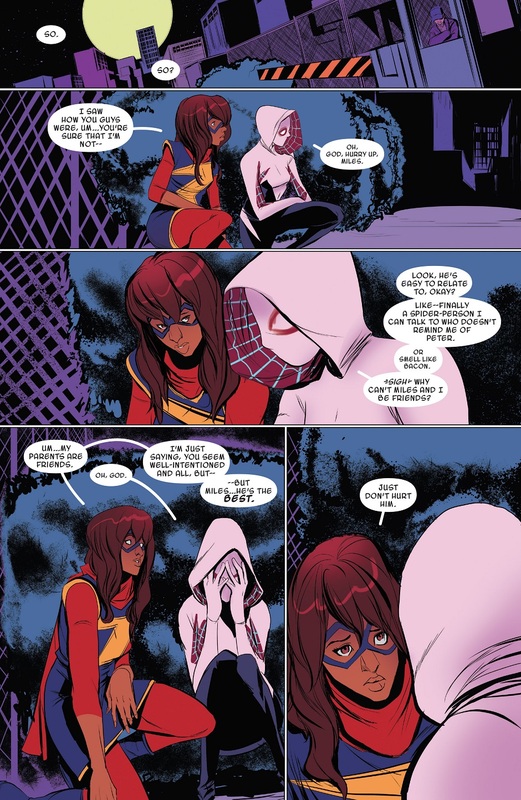 And Miles didn't try to hook up with Gwenpool, what are you even talking about? He wasn't interested in her and she was only fangirling over him, but she didn't want to date him. "The friend zone"? I don't think he and Gwen Stacy are in "the friend zone." Not the way Marvel is marketing this.